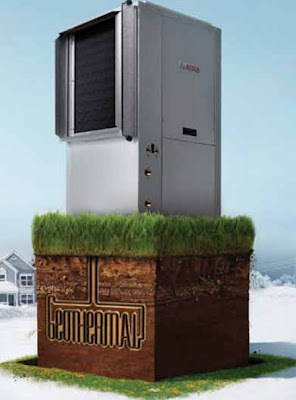 Why Bosch Geothermal Heat Pumps? Bosch Geothermal Heat Pump systems are the most energy and cost efficient systems on the market and therefore the greenest technology for heating and cooling applications. This technology uses the relatively constant temperature of the earth, which makes it extremely efficient all year long in virtually any climate. Bosch’s green technology is the most environmentally friendly way to cool and heat your home. The system has no carbon dioxide emissions or any other negative effects on the environment. Bosch’s geothermal installations reduce greenhouse gas emissions which are responsible for climate change. efficient operation over the life of the unit. Our residential warranty offering is among the best you will find on the market. Bosch’s geothermal heat pump helps to save up to 70% on your energy bills for heating, cooling and hot water because of its more efficient operation compared to conventional systems. Simple payback could be as short as 5 to 7 years and you can experience costs savings from the beginning. Geothermal heat pump systems use the earth as a heat source and heat sink. In order to transfer heat to or from the house, heat exchangers (ground loops) are installed in the ground. These consist of high density polyethylene plastic pipes. The loops are then connected to the heat pump and fluid is circulated between them transferring the heat between the heat pump and the earth.